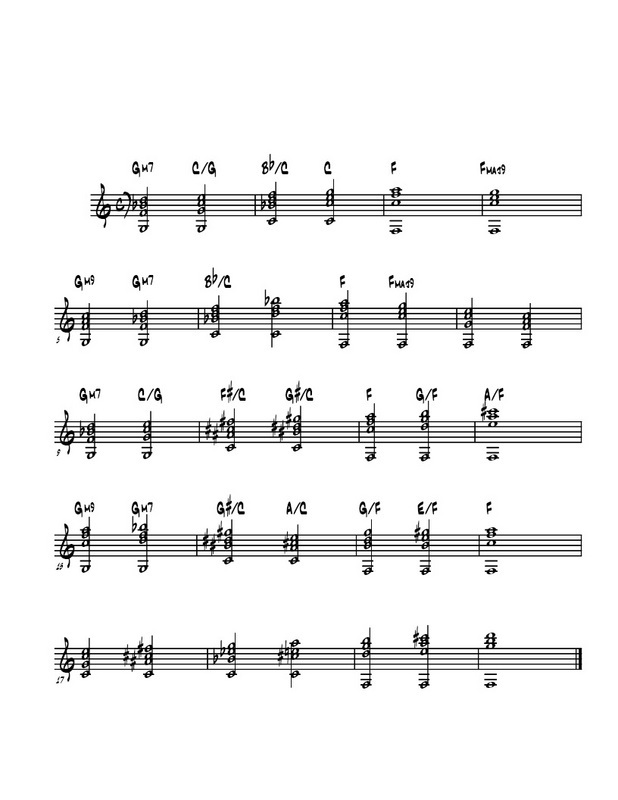 So when I started playing jazz, it was very difficult for me to learn so many scales over so many chords, and playing over moving changes and all that stuff. It wasn't until later on that I began discovering triads and how much of a big shortcut they were to playing over changes, but more particularly, they were a big shortcut to playing over chords that sometimes confused me. Let's start by stating what I mean by triads. When I say a triad, I am simply referring to 1, 3, 5. And so on! So we'll take a look at some triads and the sound they give when combined with different bass notes. Our chord progression is a II (ii), V, I, which will give us a chance to check out this triad application over a minor chord (II, ii), a dominant chord (V), and a major chord (I). b3 / 1............................... (i.e.) Bb/G Eb/C A/F# C/A Db/Bb This is also simply known as a minor7 chord. b7 / 1............................... (i.e.) F/G Bb/C E/F# G/A Ab/Bb This chord can also be a minor9, or minor 11, as it has both. 4 / 1................................. (i.e.) C/G F/C B/F# D/A Eb/Bb This chord gives off a dorian sound, having a natural 6.
b6 / 1............................... (i.e.) 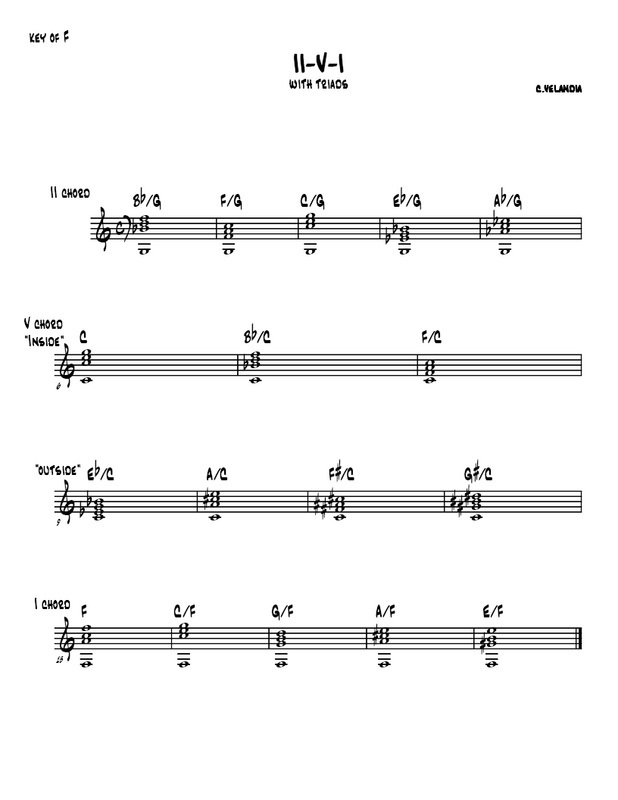 Eb/G Ab/C D/F# C#/A Gb/Bb This chord gives off an aeolian sound, having a flat 3 and flat 6.
b7 / 1............................... (i.e.) F/G Bb/C E/F# G/A Ab/Bb As a dominant chord, I treat this as a 9th chord, also a 11. 11 / 1................................. (i.e.) C/G F/C B/F# D/A Eb/Bb As a dominant chord, I think of this as a sus4. 5 / 1................................. (i.e.) D/G G/C C#/F# E/A F/Bb This is also known as a major9. 9 / 1................................. (i.e.) A/G D/C G#/F# B/A C/Bb This chord gives you a lydian sound (#4). 3 / 1................................. (i.e.) B/G E/C A#/F# C#/A D/Bb This is also known as a major7#5. 7 / 1................................. (i.e.) F#/G B/C E#/F# G#/A A/Bb This is also known as diminished major. Did you find this lesson helpful? Feel free to ask questions!